I loved my Heritage classic so this was a very hard decision for me to buy a new bike. But with all of my friends going down over the past three months due to losing control of their bikes when they got in a skid. I thought it was time for me to start looking at a bike with ABS brakes. 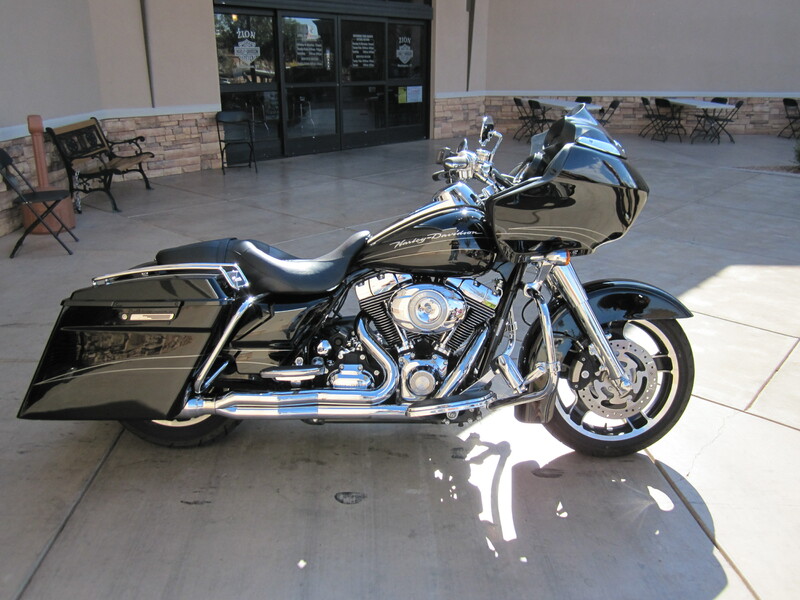 I rode a Road Guide at the Saint George Harley Davidson and fell in love with the smooth ride. (best bike I have ever been on). It took me about a week to get over the Fairing and the two head lights, (it’s just not normal). Now that I have moved past it, I have fallen in love with it. 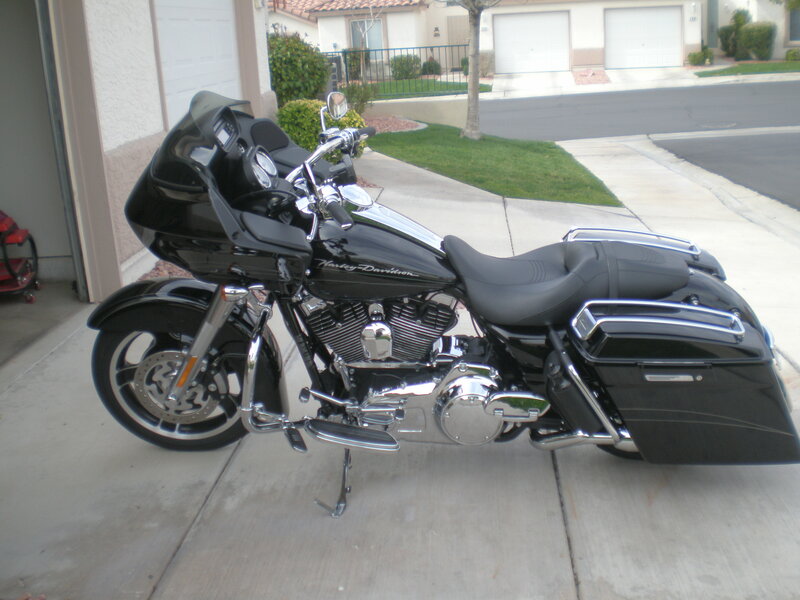 Like any new bike, we Harley owners think we can do it better than H-D so I’m replacing most of the parts with new ones. 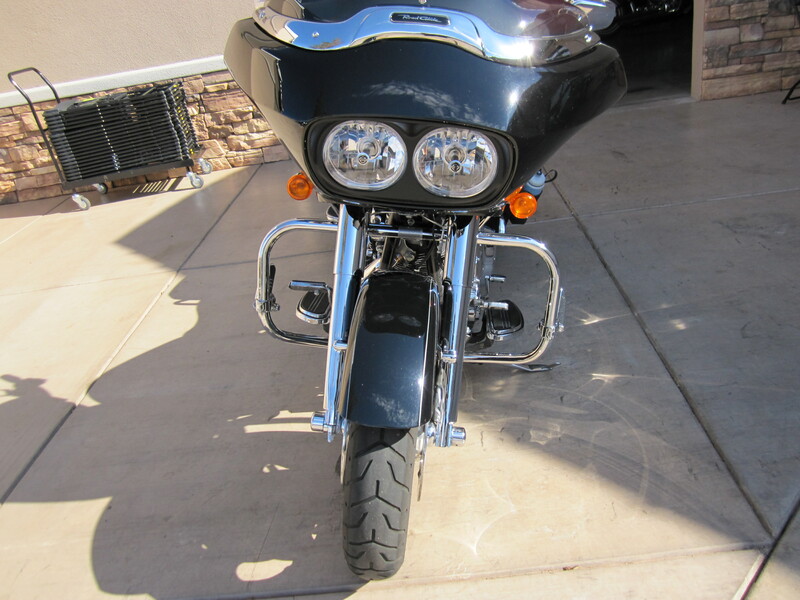 Besides replacing most of the plastic and metal with new chrome I”m replacing the back fender with an extended fender, with all of the lights set into the fender for a smoother look. I’m also replacing the saddle bags with the extended Larger bags so the back of the bike has more of a square look to it. Because H-D has gone the two into one muffler. 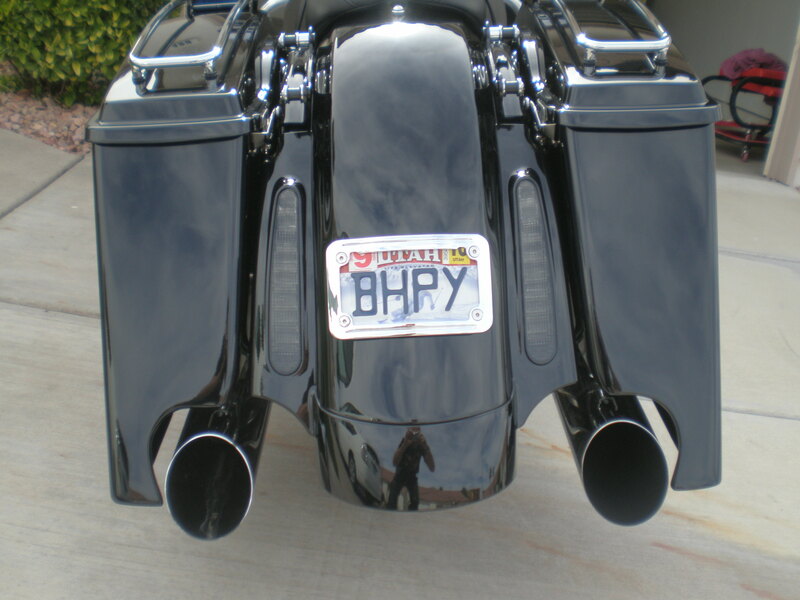 I have added a prosthetic (fake ) muffler on the other side so it looks more like the older Harley style. I also added a Racing tuner for just a little more power. Here’s the Motor, I had it diamond cut and gave it a little more power by changing it from a 96 CI to 103 CI. The finished product. 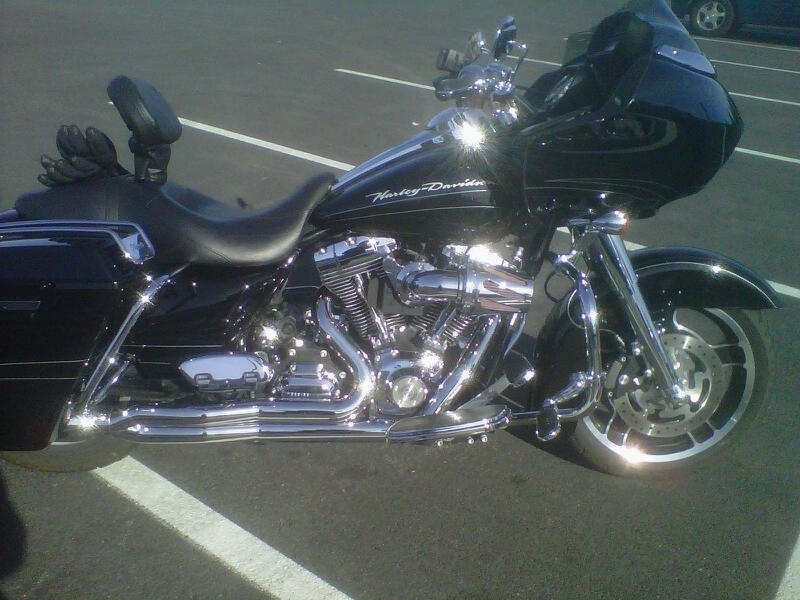 The pictures where taken by Laura Lister the parts person at Harley Davidson. Thank you Laura for keeping me up-dated! 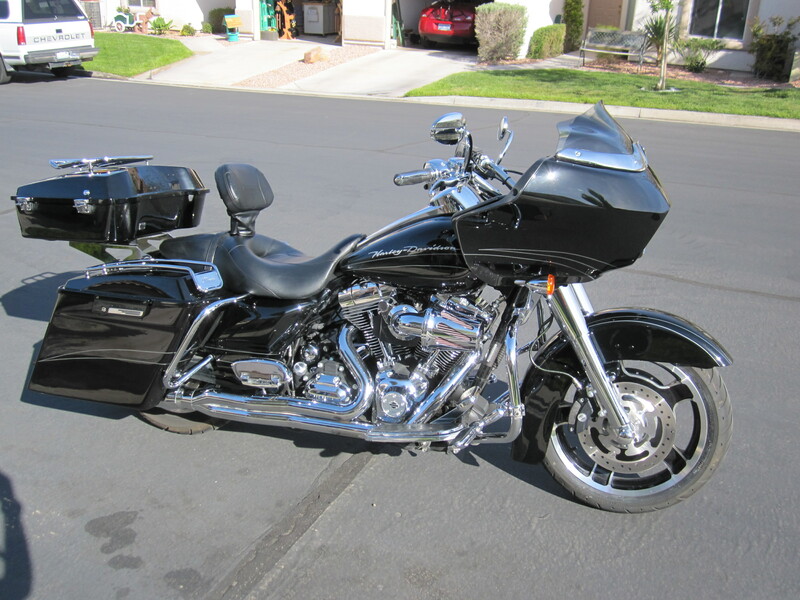 I will take some more pictures of the bike tomorrow when I pick it up. Linda and I took the bike out for the break in ride through Zions park. Great ride and the bike rides so goooood!!! That 103 engine has some real power, it really wants to run and run fast. Linda and I took the bikes to The Valley of Fire on Sunday. The wind blew like crazy! It had to be one of the worst days for wind that Linda and I have ever rode in. As you can see from the back of the bike they did not have my “fake” pipe in yet. So it looks like we will have to back down next week so they can put it on. I still love the clean look with all of the lights going down the sides of the fenders. The bike is now complete. I just need to get a 1,000 miles on it now. 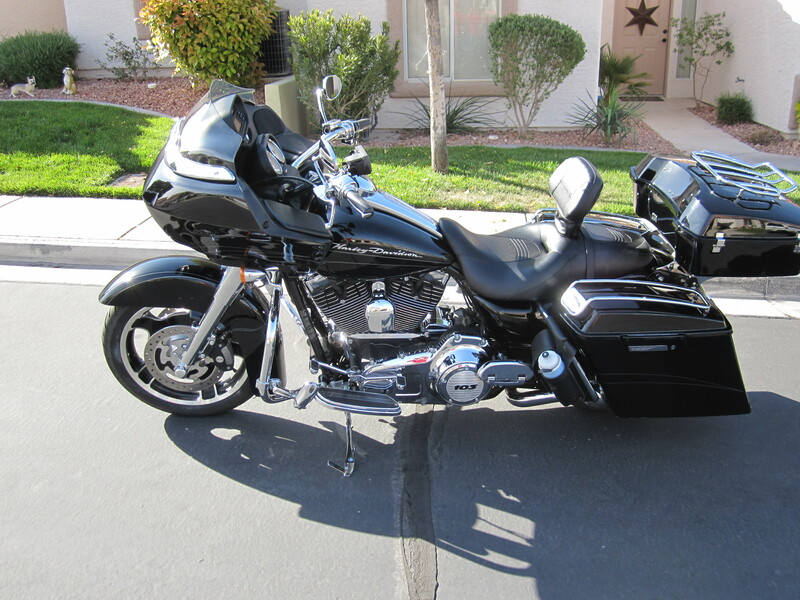 Linda and I were riding in Laughlin Nevada we decided to spend the night at the Aquarius Hotel in Laughlin. I asked if they would allow me to park in front of the hotel (where I always Park so my bike is safe) the security officer told me we had to park in the parking garage. I told them I did not want to park there because I was afraid some one would hit my bike with their door or worse. Well I was right. Some one backed up into my bike and knocked out a huge chunk out of my saddle bag and dented my fender. I cannot tell you how mad I was, in fact I was so sick I could not even make myself take a picture of the damage. The Security officers didn’t even care and the more upset I got the less they cared. 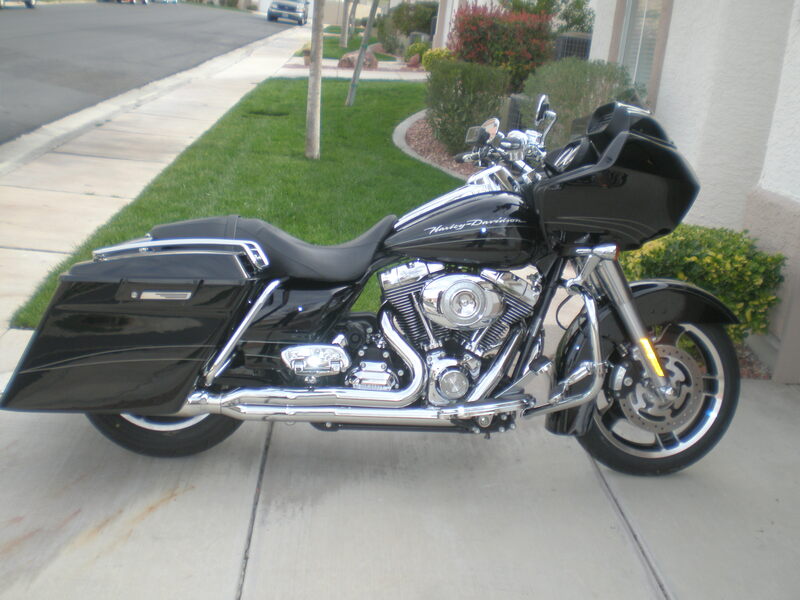 I hope everyone who rides reads this blog and no one stays at the Aquarius in Laughlin. Because I had all custom parts on the bike it took me eight weeks to get my bike back but here it is. It was Craig’s idea to take the light off, so thanks Criag I love it. Now Im ready to ride!!! Ok So I had to add one more thing to my bike. I had to upgrade to the chrome front end. Now my bike is complete. I think now my bike is complete at least I don’t think I will be adding any more large ideas in the near futrue. OK… OK… Now I think my bike is done. Here it is witth the New air filter. Love the look and I do believe it did improve my speed. but I have not tested it yet. Here it is with the trunk on it just before we started heading North to bring our bikes back to SLC. Now I think it’s done I just put on these new mirror that have the blinker built into them. You are currently browsing the Maddog62's Blog blog archives for October, 2009. Talon 1 year and growing up fast! !